We aim to construct computational principles for the creation of knowledge by establishing links between real-world information and the vast tide of language information in the world, and to create core technologies for the information infrastructure of the future. 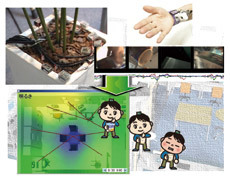 As electronic communication terminals, sensor devices, and storage equipment are become more widespread, various types of data (text, video, audio, sensor data, etc.) relating to real-world situations will be generated in increasingly large quantities. To interpret these huge quantities of highly diverse data and extract information of value to humans, we are promoting the s-room project; it aims to yield advanced mining techniques based on machine learning, where sensors are used to ascertain the status of the real world. We aim to implement advanced natural language processing so that computers can understand the meaning of words and automatically perform tasks such as extracting, translating, summarizing and classifying information. We are working on machine learning algorithms for natural language processing and constructing a large-scale semantic concept database. We are targeting machine translation as an application of these technologies. 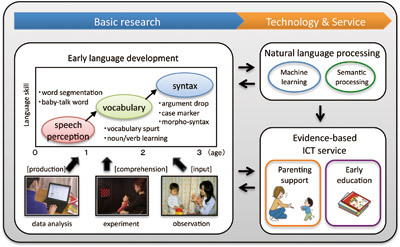 To clarify the mechanisms whereby humans understand words, we are also conducting basic research into the language acquisition process of infants.